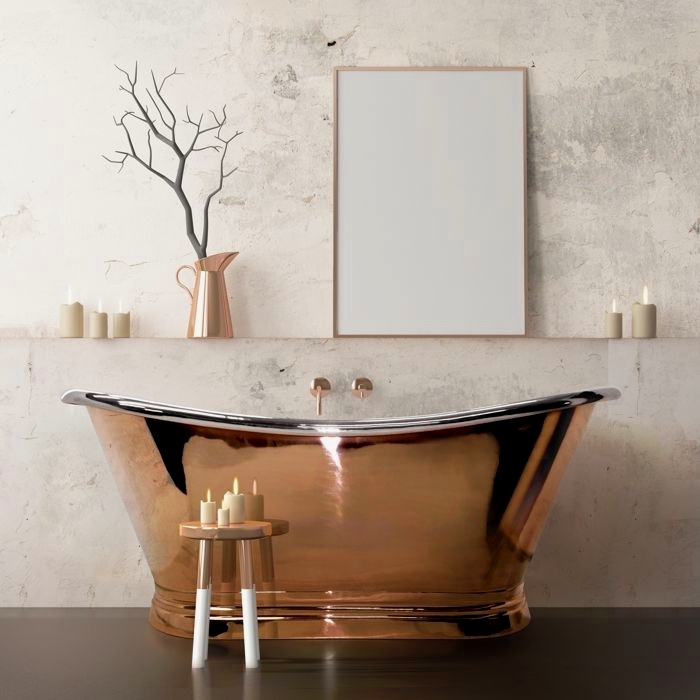 The copper bath is a leading trend this year and adding copper, brass or nickel touches will bring a beautiful depth and warmth to your bathroom. Warm metals are striking in design, better at retaining heat and can also add a real sense of glow and luxury to your space. The trend for warm metals is everywhere this season, from Pinterest to interior magazines, it’s hard to miss images of copper, brass, nickel and gold. You can add in this trend in the form of taps, basins or a bath and give your bathroom real luxury and impact. Copper baths conduct the heat fantastically, meaning that your bath water will never go cold ensuring the longest and most enjoyable bathing experience possible. 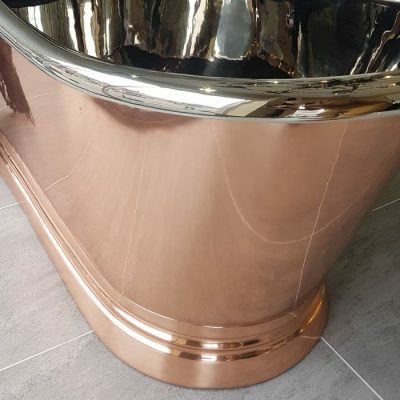 We have on display in the showroom a beautiful Copper bath with an inner made of nickel – designed by Barrie Cutchie for BC Designs. Its dimensions are: 1700L x 725w x 700h mm and it weighs 44 kilos. We have paired it with the latest industrial design of taps from the Union Range by Crosswater. Click here to see an image of these. 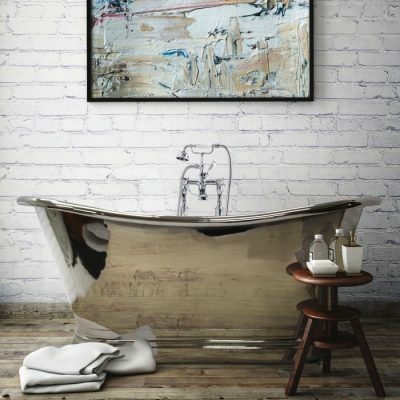 These original Copper Boat Baths are made in the traditional hand crafted manner used for centuries, and therefore there will be gentle undulations and some colour variation in the finish so every bath is unique to you. A Copper Bath is an excellent heat conductor and will maintain the water temperature much longer than Cast Iron versions. Even after the bath has been emptied it will remain warm to the touch. Baths are available in Copper Inner/Copper Outer, Nickel Inner/Nickel Outer, Nickel Inner/ Copper Outer and Tin inner/outer. And in two sizes 1500mm and 1700mm.